You go through all the effort of loading your Staging database and you click on the “Load this model from Staging Area”. Then you check your application database and there is nothing there. You check your staging database and there no errors (BizSystemFlag = 0). So what’s the problem? There are no errors in the database (or in the event log). You have to update the BizSystemFlag = 200. Now when you load the model from the staging area it will actually move the data. So you created an excel form on the Performance Point tab and you realized that put your matrix in the wrong cell (defaults to the cell you have clicked when click the add new matrix button). How can you fix it (without deleting the matrix and starting over)? You can move the matrix by changing it’s location. From there expand the workbook and sheet and click on the matrix name. Scroll down to the bottom and the second to last property is the location. You can change that to move the matrix to what ever cell you need. 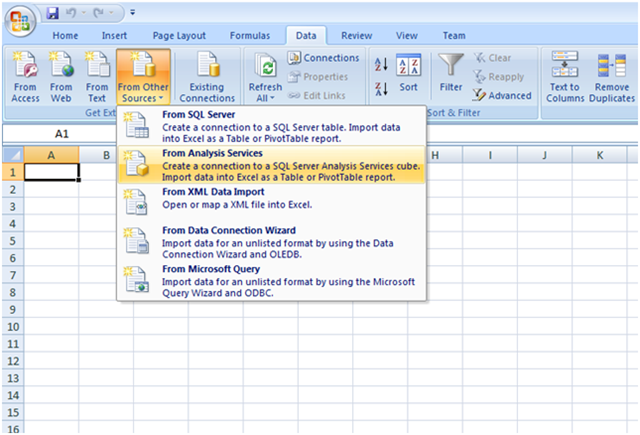 So I found out a few tips about the excel add-in for Performance Point Server 2007. Item 1, do NOT change a form template if you have a cycle created using that form template. You can not guarantee that users will get the correct version of the form template. C:\Documents and Settings\Administrator\Local Settings\Application Data\Microsoft\PerformancePoint\OfflineCache. If you can’t find the folder under Administrator, check under the current user or all users. CAVEAT: Do not delete the OfflineCache folder. Be sure you only delete the folder under the OfflineCache. If you do delete the OfflineCache folder I can’t tell you how bad Performance Point will react. If you are trying to create a form (allowing for data entry) with the PPS excel add-in, you must have a time member in the data period set for the cycle. If you don’t, no data entry will be allowed. So this means you have to have a time member for any form template you are creating. This was caused by the application pool PPSMonitoringWebService running as the wrong account. No matter what else you do you have to make sure that account has permissions to your database. Dashboard Designer,what’s my connection string again? In the Performance Point Server 2007 Dashboard Designer, you create a data source using either a standard connection or with a connection string. I use the connection string option myself, but I never remember the syntax of the connection string (to a AS cube). Viola, there is the connection string to your cube. Now you can copy and paste that back into Dashboard Designer. So I have been doing a PPS proof of concept and I have created cycles (I am not going to explain what a cycle is) that I no longer want (or need). So I wanted to delete some cycles and found it not easy to figure out. In the Workspace Browser, click Process Management, then select the cycle you want to delete. In the cycle tasks pane, click Available Actions in the Select Action list, then select Close. Then repeat and select Purge from the Select Action list. After you click ok all the assignments and jobs are deleted. Now the problem is that the cycles are still there??? And you can no longer go to the Available Actions. Here’s that one trick you have to remember, the Business Modeler has to be refreshed so click the refresh model site arrows icon (or press F5 or View->Refresh or close and reopen). Yeah this took me a while to figure why the cycle still showed up after supposedly getting rid of them. The moral of the story is always remember the Planning Business Modeler sometimes automatically and sometimes it doesn’t so ALAWYS click the refresh buttons. Here are the hardware prereq’s for Performance Point Server 2007. The following table lists the minimum and recommended hardware requirements for clients and servers used by PerformancePoint Planning Server. So if you want to make sure your clients can use the Excel add-in. Here are the prerequisites for the add-in (from the Deploying PerformancePoint white paper). · The Microsoft .NET Framework version 2.0.50727.42 or later. To enable Export to Excel functionality or Export to PowerPoint functionality in Microsoft Office PerformancePoint Server 2007, you must install the Microsoft .NET Framework version 2.0 on the computer where these commands are executed. Be sure that you have Microsoft Core XML Services (MSXML) 6.0 installed before installing OLE DB Provider for OLAP Services 9.0. Here is an excerpt from the MS white paper on deployment of Performance Point Server 2007 on the server roles of PerformancePoint. The security model for Planning Server is based on roles. Users are assigned to roles, and their permission levels in the Planning Server system are dictated by the roles to which they belong. The two types of roles are administrative roles and business roles. Each role enables its members to perform a specific set of tasks within a specific scope. 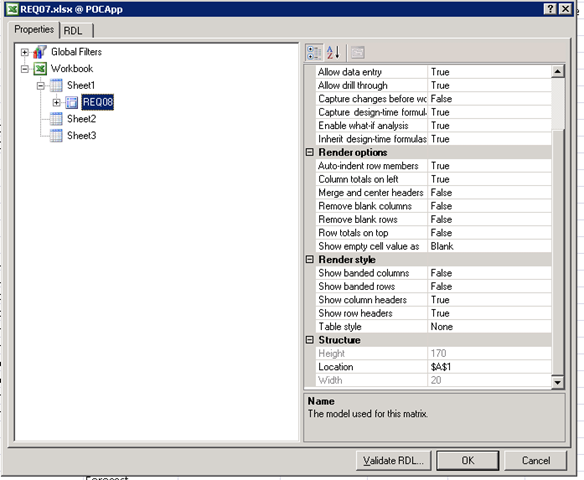 These roles are configured in the Planning Administration Console. More information about administrative roles is available in the “Security and roles” section of the Planning Business Modeler online Help. The Global Administrator role has a system-wide scope. The other administrative roles have either an application scope or a model-site scope. At the application level, a user in the Modeler, Data Administrator, or User Administrator role has permissions for all model sites in the application. At the model-site level, a user in the Modeler, Data Administrator, or User Administrator role has permissions only for the specific model site. Each role enables its members to perform a specific set of tasks within a specific scope. The following table provides a high-level description of the administrative roles. Users who belong to multiple administrative roles can perform all tasks that are associated with each role. Global Administrator Create and delete applications and model sites. A user who belongs to the Global Administrator role cannot connect to a server in Planning Business Modeler unless he or she also belongs to another administrative role. The only exception is to create the first application on Planning Server. A user who belongs only to the Global Administrator role can open Planning Business Modeler to create the first application. Because of the potential for database errors when you use a multiple-server environment, we recommend that all Global Administrator tasks are performed in the Planning Administration Console. · Create, modify, or delete models, dimensions, and member sets. · Deploy models and model sites. · Create, modify, or delete assumptions. · Create, modify, or delete cycles, workflow assignments, and calendars. · Create, modify, or delete associations. · Create, modify, delete, or run rules. · Create, modify, delete, or run jobs. However, they cannot run Data Load, Data Export, or Data Movement jobs. · Create, modify, or delete business roles within their scope. However, only members of the User Administrator role can manage role membership. Users who are assigned to the Modeler role have unrestricted Read and Write access to all business data within their scope. This is true even if they belong to a business role that has restricted settings. · Run, synchronize, or load associations. · Run Data Load, Data Export, or Data Movement jobs. · Synchronize data to and load data from the application or staging database. Planning Business Modeler uses the PerformancePoint Service Identity (SI) account to perform data integration tasks on a staging or application database. This account must have explicit permissions to the Microsoft SQL Server 2005 database. Users who are assigned to the Data Administrator role have unrestricted Read and Write access to all business data within their scope. This is true even if they belong to a business role that has restricted settings. · Assign users to and remove users from Data Administrator, Modeler, and User Administrator roles that have a model-site scope. · Assign users to or remove users from business roles in the model site. · Edit user permissions for a member set in the model site. This feature must first be enabled by a member of the Data Administrator or Modeler role. 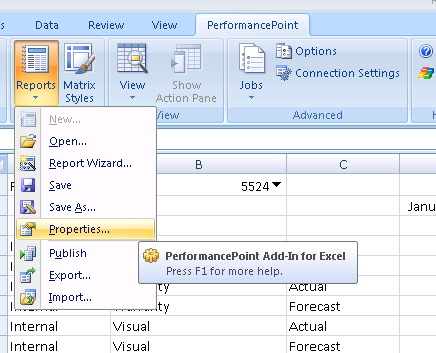 Business roles are defined for users who work with actual business data in PerformancePoint Add-in for Excel. Business roles are created and configured in Planning Business Modeler by members of the Data Administrator role or Modeler role. After business roles are created, users are then added to the business roles by members of the User Administrator role. Complete information about business roles is available in “About user-defined business roles” in the Planning Business Modeler online Help.